We ask that you arrive 10 minutes prior to your appointment time to complete a health questionnaire and register with the clinic. Your first visit will take 45 minutes – 1 hour. To start with you will be asked about your main complaint and general health. After listening to your concerns your Chiropractor will perform a thorough examination (including a postural evaluation, orthopaedic testing, a neurological examination, muscle testing and palpation of the joints and muscles associated with your injury). Following your examination, your Chiropractor will spend some time explaining your current problem, how it developed and how they can help correct it. 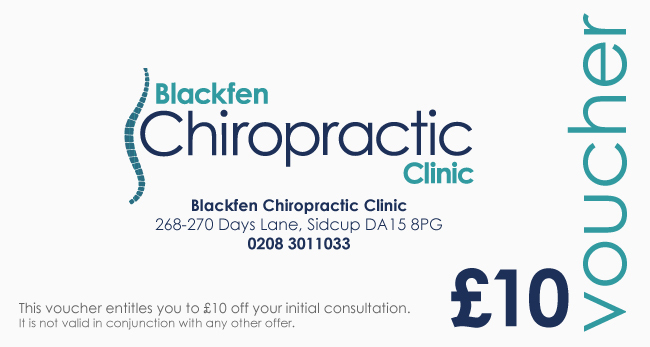 At Blackfen Chiropractic Clinic we like to perform treatment on your first visit to start the healing process. If your case requires further imaging e.g. x-rays, MRI scans or Ultrasounds scans, your Chiropractor will discuss this with you and will be able to refer you to the appropriate service. We know that the first visit can feel like an overload of information. To help you make sense of it all your Chiropractor will email / hand you a report on your case. We find that when patients have a good understanding of their condition, they are often in a better position to assist recovery.